Alex Rousso on a new format. Last month’s WPT UK National event at Aspers Casino in Stratford was the first time the new “Accumulator” structure has been used in the UK. The idea is pretty straightforward: there are three day one flights, players are allowed to enter one, two or three flights, and the total chips from all flights a player enters are accumulated to give their day two chip count. In other words, it’s pretty similar to a re-entry event, but you can only enter once per flight and the chips from each flight are combined (as opposed to a re-entry, where if you chose to enter another flight having already made day two, only your highest stack gets counted towards your day two chip stack). The idea was first introduced at the WSOP APAC in Melbourne this year. It seems, with re-entries becoming the new vogue, WSOP were keen to tweak the idea to suit the short starting stacks in the small WSOP events. Re-entries are particularly attractive for casinos because they get to charge the juice more than once, unlike re-buys. They are also attractive for players because they give them multiple “bullets” to fire, which reduces the effects of variance. The event was a success in Melbourne. Hellmuth tweeted that it was a good chance for players who had travelled a long way to get their bearings, and plenty of discussion of strategy abounded. Interestingly, he tweaked the structure a bit. First, the day one flights had a mere eight 30-minute levels, so that they could fit three day one flights into a four-day schedule. Second, players started with 20k in chips with a big blind of 100 in level one. The antes also kicked in at level three. To counter this speedy opening, the day-two blind levels were 40 minutes long and the day-three levels 60. The Accumulator structure aside, this is quite a radical approach in itself. It’s a variant on the “deep and steep” idea but, if anything, in reverse: chip stacks start off relatively shallow and, although they don’t get deeper as the tournament goes on, they do become much deeper than the average tournament. “Once we got to the business end of the tournament,” explains John, “stacks were never less than 60BBs deep.” That’s quite impressive for a small buy-in tournament. Some players have complained that re-buys and re-entries are ruining the game for low stakes players – especially since players with bigger rolls have a certain advantage over players only rolled for one bullet. (The effect is largely the same as that of ICM when small-stacked players have to fold in the face of all-in aggression from stacks that cover them.) However, the advantage of structures like this is that it at least gives low-rolled players a shot at a big title. Many of those players enjoy playing in tournaments that will look good on their Hendon Mob page if they cash and give them an opportunity to play against more well-known players. “It’s effectively a £600 buy-in tournament,” claims John Scanlon. “But this way, the smaller player can qualify for a £200 buy-in. We managed to qualify 157 players in satellites at Aspers during the week, and about another 50 qualified online at Party Poker. That’s over 200 qualifiers in a final field of 510 entries.” The £600 entry is just about enough to attract the bigger players (although their “day one” would effectively be spread over two days), and the high percentage of qualifiers should make the fields attractive for them too. By appealing to both low stakes qualifiers and bigger players, the event attracted a good mix of players. That benefits both types of player, and the organisers as well. As for strategy, I think it depends on how you are rolled. At one extreme, the higher stakes players are likely to use all three bullets because it is effectively for them a £600 buy in tournament, as Scanlon points out. At the other extreme, qualifiers may only be able to afford one bullet. Needless to say, the more bullets you have, the more risks you can take, which will entail more looseness and aggression. This may in turn benefit the tighter players – who are likely to be the ones with only one bullet – as they can wait for a spot to get paid off. However, players with only one bullet should beware that they won’t have too long to sit back. With the structure as it is, they will pretty soon have a mid-level tournament stack. By level three (100/200 w 25), they’ll have an M of around 30; having this only one hour into a tournament will be quite alien to most tight players. As mentioned, this is compensated for later. Make it to halfway through day two with an average stack, and you’ll probably still have roughly the same M, which is virtually unheard of in a tournament of this buy in. As for those in the middle ground who are considering how many buy-ins is optimal, I would suggest that re-entering is somewhat like adding on in a rebuy tournament. A good rule of thumb for add-ons is as follows: you should not add on if you will still have a better than average stack once everyone else has added on. Once again, this is informed by ICM: extra chips diminish in value the more chips you have. So if you have already made day two in an earlier flight, it’s not a given that you should enter again. If you’ve busted all previous flights, assuming the field is soft enough and you are rolled for it, it always makes sense to re-enter. Once again, this is down to ICM. Your chips are proportionately more valuable the shorter your stack, and your starting stack will, by definition, be shorter than the average day two stack. In this sense, players should keep an open mind as to how many flights they should play. The WPT UK National tour will keep this structure throughout all its main events. 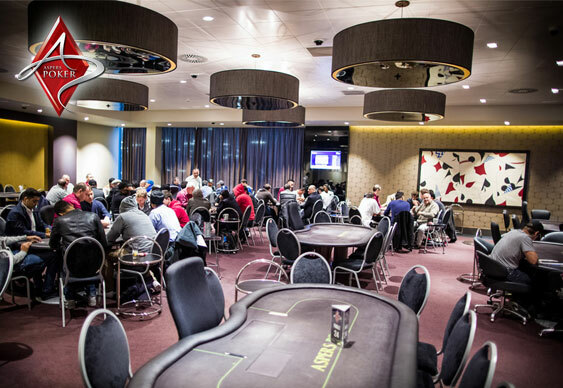 The next event starts on Dec 19th in Milton Keynes, followed by a return to Aspers Stratford in the spring.